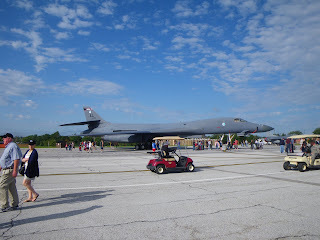 It's been over 12 yrs since Pete and I have been to the air show here at Offutt. 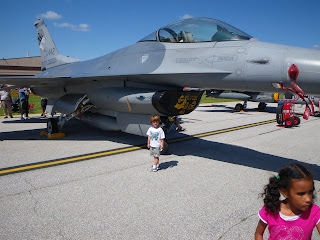 Pete really wanted to take Ben this year and see the Blue Angels. 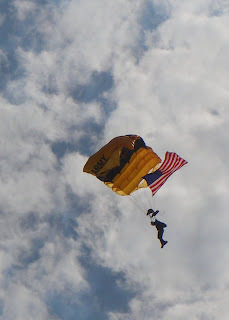 The plan was to go in the morning and see the Golden Knights parachute team, leave, and come back in the afternoon for some Blue Angels. The plan doesn't always work. We got sucked in and stayed ALL day! A L L DAY!!!!!!! The only thing that made it bareable was the temperature. This morning when we left the house it was 63, and the high today was only 74 - so a great day to be outside - A L L day. The Blue Angels were awesome - as expected. But the 45 minute intro of pilots, flight line checks, and taxing could've been done without. The line for the shuttle bus back to our car wasn't terriblly long - probably one of the shortest. By the time we got home we were A L L exhausted. Now to lounge around this evening and debate on whether it's going to be too Cloudy or cold for the lake tomorrow - (high temperature only 72 and I'm just guessing here, but I'm thinking my wet suit isn't going to fit me these days).